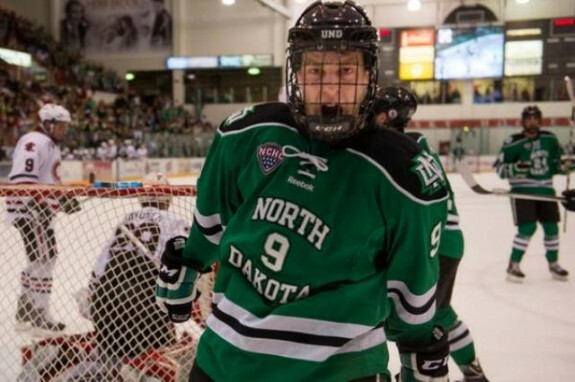 This past weekend, the University of North Dakota split their important two-game conference series at home with the Miami RedHawks. Friday night, the RedHawks held off a late serge by UND to win 3-2. On Saturday night, UND gave up the first goal at 1:07 of the first period and then scored three unanswered goals in the second period to beat the RedHawks 4-1. Last February, prior to UND’s home series against the Nebraska-Omaha Mavericks, the UND coaching staff paired Drake Caggiula, Mark MacMillan and Michael Parks together on a forward line. That line played together for the rest of the season and experienced a lot of chemistry and success together. Through the remaining 19 games of the season, they scored (14g-26a—40pts). On Friday, MacMillan returned to the lineup after missing four games with a wrist injury. With MacMillan’s return, the UND coaching staff decided to reunite the aforementioned line from last season. Putting Caggiula, MacMillan and Parks on the same line paid immediate dividends for UND. For the weekend, the speedy trio scored (6g-5a—11pts). Caggiula was UND’s leading scorer during the series against the RedHawks, the junior forward scored (3g-2a—5pts). For his efforts, Caggiula was also named the NCHC player of the week. In the second period of Saturday’s game, Caggiula brought the crowd to his feet when he scored an amazing highlight-reel, breakaway goal at the 6:06 mark to give UND a 2-1 lead. UND never looked back from there. Watch the video of Caggiula’s goal below. After 11 games, Caggiula (6g-10a—16pts) is tied for scoring lead nationally and is the NCHC’s scoring leader. Fellow line mate Parks (5g-9a—14pts) is tied for second in the NCHC in scoring and tied for 11th nationally in scoring. I was impressed with how fast MacMillan was able to get back up to game speed after missing four games with the wrist injury. Head coach Dave Hakstol talked about MacMillan’s fast recovery. Finally, UND has gotten balanced scoring early in the season. This past weekend, only one other forward not named MacMillan, Caggiula or Parks recorded a single point – that was Bryn Chyzky (0g-1a—1pts).